Stations of the Cross - Wednesday, 3/20/19 @ 12:25 P.M. in church. Please join us. All School Mass - Friday, 3/22/19 @ 8 A.M. Please join us. Wonders Unit 5 Week 1 Tests - Friday, 3/22/19. PTG General Meeting - Wednesday, 3/20/19 @ 7 P.M. in the school Cafeteria. Is your re-registration turned in? Please return your forms and fee to be sure to have a homeroom assignment for next year! 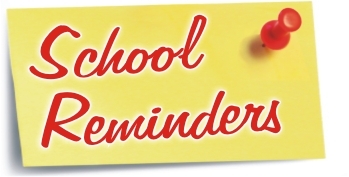 At the present time the school calendar includes the following days as “STUDENT NOT IN ATTENDANCE” days February 15 and 18 and March 29. Because of the three snow days we used February 15 and 18 and will use March 29 as snow make up days and school will be in session and these three days are attendance days for students. Please include your check for $50.00 and return completed items to the school Office. It is very important that all students arrive at school by 7:35 A.M., to enter at 7:40 A.M. and prepare for the day in a timely fashion. Our instructional time begins at 7:50 A.M. Please help your child to arrive on time. Most of you are very good at this. Coming later is a disruption to the school office, class and teacher. After 5 tardy entries, you will be contacted in writing. All tardy arrivals and absences require a written (not emailed) excuse from home. Thank you for your cooperation and attention. Your child's safety is our first priority. School Uniform Reminders: All students are expected to follow the approved uniform every school day including gym days. If you have any questions about the uniform, please be in touch. When sending money/forms to the office, it is most helpful if each is in an envelope and addressed as instructed on the form. MANY forms go through the classroom/office on a given day and will certainly get to the right spot if in an addressed envelope. In addition, if you are sending money for more than payment, separate checks or envelopes with exact change are a MUST! The office staff does not keep cash on hand and can not separate checks/cash for separate committee chairs. Envelopes with multiple payments in one lump sum/check will be returned to you. Thank you for your cooperation on these matters. Place the Religion Key Words in the folder after studying each night. Homework Checklist should be signed each night...even if there is no homework. Most evenings there will be at least one assignment written. You can skip the days when there is no school. Students are to show parents the form and completed assignments and get the signature. A written excuse should be sent upon return or before anticipated absences from/tardies to school. Written excuses are required, by the state, for any absence/tardy arrival. Please be sure to use the school note form which can be found on the school home page. These forms should also be used for ALL other communications with school regarding your child. We want to ensure the safety of your child in transportation and other matters. Please be sure to use to school note form to ensure that can happen. Watch for Pittsburgh Public Schools for any weather related closings and delays. We follow all Pittsburgh Public Schools closings and delays instructions. If your particular district closes or delays, your busing will follow suit. Often, parents ask if 2A will follow a homework "schedule". The answer is, sort of...we usually have Weekly reading, Spelling tests, and so on. However, some evenings we have no homework. On these evenings, it is expected that a parent sign the Homework Checklist, which should always remain in the Homework pocket of the Homework Folder, which will come home the first week. Why? On the evenings with no assigned homework, it will be assumed that you will take advantage of the opportunity to practice math facts, religion key words, spelling words, writing complete sentences and the like. Homework is much more than just "worksheets" and preparing ahead at home makes our efforts in school more effective. Thank you for your attention to homework and for helping your child to succeed in grade 2. Together, we make a great team!